Pittsburgh Pennsylvania home inspectors and Certified Home Inspection Services, LLC realizes that the purchase of a home is probably the largest and most exciting investment you will ever make. It is difficult to remove any emotional attachment you may have for a home due to it's location, style, setting, etc. A home inspection will help you learn as much as you can about the property you are considering buying in an effort to help you make a more informed decision as a buyer. Forrest Marketing is the owner of the copyright for this website. The web server used by Certifiedhomeinspectionservices.us is located near the city of Minneapolis, USA and is run by Star Tribune Newspaper. 15 other websites are located on this web server. Most of them are provided in the english language. 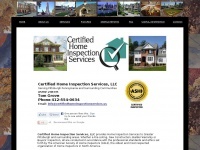 The websites of Certifiedhomeinspectionservices.us are served by a Apache server. The markup language of the website is HTML 4.01 Transitional. The visitor analysis software Google Analytics is used to analyze the visitors of the websites. Both the inclusion of the website in search engines and follwoing of its hyperlinks is explicitly allowed.